Have you ever been at a place in your marriage where you wondered if you would make it? Or where you felt trapped because divorce was simply not an option but it seemed so hard to consider the future in relation to your present? I should say we have, because I know Sean has felt these same things. Marriage is hard work, and “they” tell you that all the time before you get married — your pastor and mentors and friends and books…they all tell you. But when you’re in love and have a dreamy-eyed view of marriage, it just doesn’t sink in what “hard” means. Sure, he’ll leave his socks on the floor, and I’ll just pick them up and put them in the basket. Sure, we fight sometimes, but it’ll be easier when we’re married. Sure, we both have baggage from our past, but we love each other, and that’s all that matters. If you’re married, I know you’re shaking your head right along with me. It doesn’t take very long for the truth to become apparent. I still remember our first fight after we were married. I don’t remember what it was about, just that it was on the second day of our honeymoon. Two days as a married couple, and we already didn’t want to be in the same room. Off to a great start. Things were good for a while. We took a cross-country adventure, moving to Utah for two years, and we started a family. But we also had a miscarriage, dealt with layoffs and some really tough financial times and faced the inevitable loneliness that happens when you move to a state where you literally know no one. Then we added a second baby, built a house and moved when I was eight months pregnant with our third daughter. I was incredibly hormonal. The littlest thing set me off, and the angrier I got, the more Sean pulled away. Who could blame him, really? Divorce was not an option for us, but I think we both wished it was at one time or another. Somehow, though, while raising three little ones under three years old, we hung on. Barely, by the skin of our teeth, but the important part of the story is we hung on. The turning point for us, looking back, was our decision to attend a marriage conference at church. If you know my husband, conferences are not his thing. At all. But he went, and for that I am incredibly thankful. I don’t remember most of what was said at that conference, but as we stood in the doorway to the sanctuary with our fussy six-month-old, the female speaker told the story of her hormonal outbursts following the birth of their second child. She was weepy, angry, short-tempered and more (sound familiar?). She said that her doctor told her that following the birth of each child, it takes your hormones an additional year to get back into balance. So your first child, one year. Second child, two years. Third child, three years. And so on. I don’t know if that’s really true or not, but it resonated with me. She was put on a low dose of antidepressants and slowly things improved and they were able to work on the issues in their marriage without her hormones interfering. After the session, we were sent out to walk around outside and just talk and reflect as a couple on the things we heard throughout the day. We made the decision then and there to call the doctor and schedule an appointment. Antidepressants weren’t something I really wanted to consider while still nursing, but something had to change. As it turns out, I never made the appointment. For me, acknowledging the cause of our issues — and having my husband understand that it was really, truly a biological, hormonal issue — was enough for us to start the healing process. But if it hadn’t changed? I would have gone, and I would have accepted the prescription slip. This may not be a popular thing to say, but I would have even weaned the baby in order to save my marriage, if that’s what it had taken. Thankfully, it didn’t take that, and slowly we started to heal. Today, three-and-a-half years later, I am incredibly, head-over-heels in love with my husband. He is an amazingly supportive guy, a wonderful dad and my best friend. He walks into a room and my heart skips a beat. And my girls roll their eyes several times a week when I tell them how much I love their daddy. It didn’t happen overnight, but I am so thankful that we not only “stuck it out” but actually made a decision to seek help. I say this, not to gloat, but to encourage you. If things are tough in your marriage right now, there is hope. 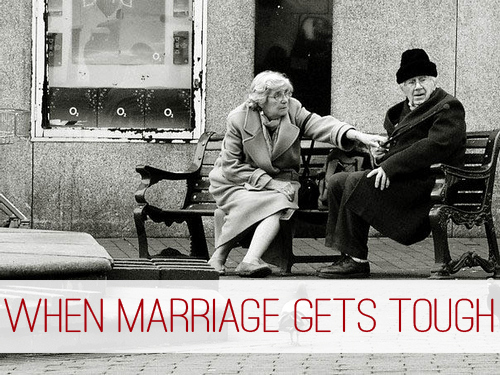 Are you looking for ways to strengthen or save your marriage? Be sure to check out this bundle of marriage ebooks at BundleoftheWeek.com (available until 8am EST on 2/11) plus this FREE Art of Love Relationship Series, featuring more than 50 marriage experts over 10 days of live webinars! Thank you so much for sharing your journey with us. I know it took incredible courage for you to share such personal details. Our story is similar to yours in many ways. I think it’s great that you didn’t have to go on antidepressants and stop nursing, but I commend you for being willing to do that if it would have been necessary. I think this is such an important issue, and I appreciate your encouragement. It is such a blessing to live in a happy marriage, and so worth the work! I agree, Heather — definitely worth the work!